When the day’s losses are reached, good traders do not trade for the remainder of the day. This is a practice that is considered to be one of the ways to bring back normalcy to trading while also ensuring that the trader takes a break from their trading routine. Many professional traders, especially at trading firms pursue the concept of having a daily, weekly and a monthly stop loss limits. Once these levels are reached, trading is no longer done for the day, or for the remainder of the week or for the rest of the month. In fact, some professional traders and even prop firms go as far as ‘benching’ the trader, so that once the daily, weekly or monthly trading loss is hit, trading is done on a demo account, until the trader gains back their confidence. While the concept of setting trading limits might seem farfetched, following these methods can help traders to preserve their capital and also build a more disciplined and a professional approach to trading. Following the concept of trading limits can also help traders to focus on building a good trading plan and also having a good trading strategy. Why should you set a trading limit? 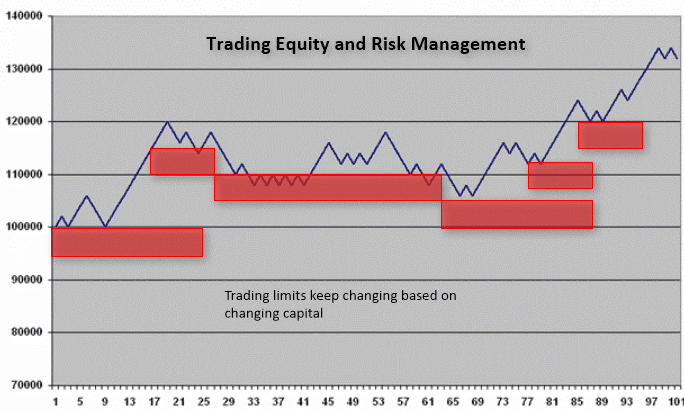 Setting a trading limit has benefits for traders for a number of reasons. 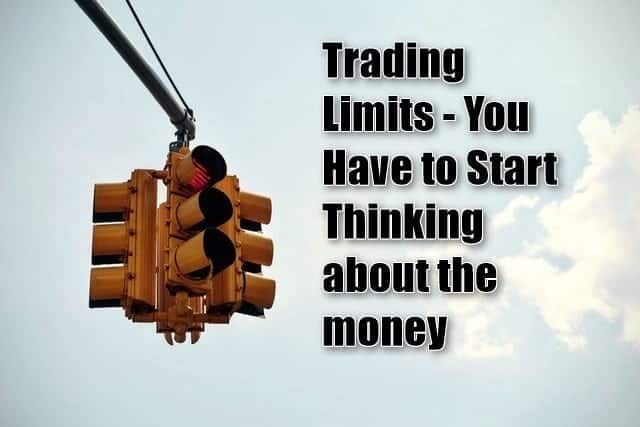 The most important being the fact that a trading limit can help a trader from over trading, which one of the major reasons why traders often end up ignoring the trading rules and allow for emotions to start dictating their trading. Almost every trader has come across a point in time when the urge to trade more, or to ignore the trading rules and to allocate more than the required number of contracts takes over. Times such as these are when the trading rules are ignored and the emotional aspect takes over which can lead to the trader to base their decisions based on emotions and gut feel rather than logic. Times such as these can be disastrous as such type of trading approach can quickly see the trading capital being eroded quite quickly. The losses can also pile up quickly, especially when it coincides with any key economic releases or on some undiscounted news. Setting daily, weekly and monthly trading limits is often a practice that is followed by professional traders. You can also find these to be an integral part of an online trade journal as well. The above image shows a sample outline of how automated online trading journals incorporate the trading limits. Although it might go by different names (goals, in this example) the concept remains the same. In the above image, you can see the weekly, monthly and yearly numbers in terms of the profits and losses made both in points/pips as well as in dollar value. Setting the goals by limiting the losses to, for example, a 20% monthly loss on the automated trading journal system will alert the trader once they are nearing or hit the trading limit. The above can, of course, be done manually in an excel sheet as well, but will require manual input of data. Trading limits can be set on a daily, weekly or monthly basis. It is up to the trader on how much of a limit they want to set and the answer to this question is in the trader’s trading capital and of course their tolerance to risk. The most widely accepted principle in trading limits is to use a 1% or 2% of the trading capital as the maximum loss one can take. However, this is usually applicable on a per trade basis. In other words, with a 1% trading loss per trade, a trader is able to trade many times before losing their entire trading capital. The concept of setting trading limits on a daily or weekly or monthly basis is slightly different to the trading limits that are set on a per trade basis. For example, if you had a 1% trading loss on a per trade basis, then setting a daily limit of 5% means that once you have five losing trades, which leads to a 5% loss for the day, trading is ceased for the remainder of the day. Likewise, if you had a 10% trading loss for the week and you reached this trading loss limit by day 3, then you would cease trading for the remainder of the week and so on, for a monthly trading loss as well. The amount you want to risk can also depend on a number of other factors. For example, besides pursuing the 1% – 2% trading loss limit, another way traders focus on setting their trading losses is to focus on setting a percentage of the profits they are aiming for as a trading loss. Thus, if a trader is aiming for a daily return of 1.5%, then they can set their daily trading loss at 0.75%, or 0.5% depending on their expected rate of return and risk tolerance. A simple rule of thumb is to set a 20% or a 10% trading loss limit for a month. Considering the fact that in most trading months, there are 20 trading days, this translates to 1% loss per day. Of course, this would mean that the trader will have to take on extremely smaller positions on their trades, especially if their trading capital is low. What happens when you reach your trading limits for the day or the week? In the event that the trading loss limit for the day or the week or month is reached, no further trading is done for the remainder of the period (day, week or month). Some prop trading firms usually make the traders go back to trading a demo account until they start to regain confidence in their trading. It is common knowledge that the market often shakes up weak positions every now and then, and sometimes even the best of traders are not immune to this market shake-up. In times like these, traders often end up dealing with emotions that can eventually rule their trading decisions that could lead to potential further losses. By switching over to trading on a demo or a paper trading account, traders can trade risk-free while also giving themselves time to recover from the market shakeup. Besides a demo trading account, going back to analyze the losing trades that resulted in the trader hitting the trading loss is no doubt one of the best ways to take a break from live trading and also to deeply analyze the decisions that led to the trader taking the losses. In order to do this, however, traders need to follow and maintain a trading journal so that all their decisions are documented. Sometimes, using a market replay or a simulation application can also help to understand what really went wrong and can help traders to get to the bottom of the issue. Mike Bellafiore, trading mentor, co-founder of SMB Capital and author of the best sellers, One Good Trade and The PlayBook recommends that traders should focus on the first six months of following the concept of trading limits. Bellafiore, who trains many prop traders says that the stop loss one sets on a daily, weekly or monthly basis should accommodate the trading style. Having too small or too big a trading limit loss can have adverse effects and therefore, traders should give themselves enough time until they find the sweet spot. Another important point that Bellafiore suggests is that the stop loss limit at least for the daily time frame should be set in such a way that the trader should be able to take 8 – 10 consecutive losses. Because this comes from a prop trading firm where trading volumes are high, for the average retail trader, setting a weekly trading limit so that they can take 8 – 10 consecutive losses is a better option. Of course, the number can be tweaked based on the trader’s style of trading and the markets involved. 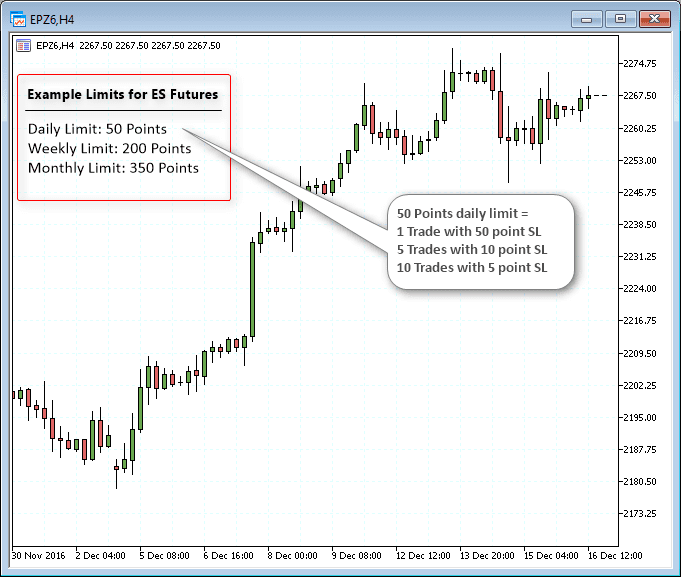 Does having trading limits give any benefits for traders? 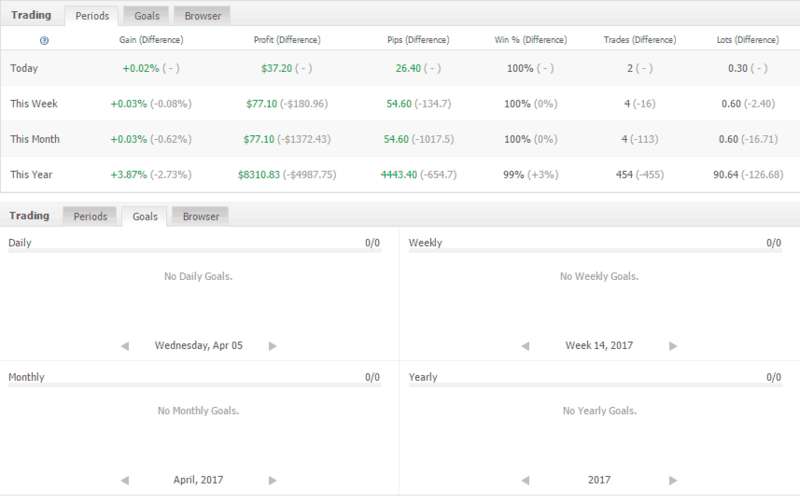 The benefits of following a disciplined trading strategy including risk management techniques have been well documented. The concept of trading limits allows traders to focus on limiting the losses on their trading while at the same time ensuring that the checks in place by following the system helps traders to also keep a tab on their emotions. As outlined in the above article, there are many different approaches to limiting the losses on trading. However, regardless of the type of approach taken, the bottom line is the fact that the benefits of having trading limits far outweighs the limitations one might feel that comes with it. While retail traders might brush aside the concept of setting trading limits, the fact that it is widely used among the professional trading circles and prop trading firms is a testament to the fact that the risk management method is a proven way to keep one’s emotions in check while trading. Trading limits can also be beneficial when it comes to managing drawdown and also helps traders to recover from it as well. The drawdown limits will, of course, depend on the trading strategy’s performance and the trader’s approach to risk management. Another benefit of using trading limits is that it helps traders to understand how their trades have been performing in different market conditions. By revisiting their trading strategy and the market conditions, traders are better able to view the strengths and weaknesses of their trading strategy. Such an approach helps traders to look at different options in terms of what trading strategies they can use and what methods to avoid depending on the way the markets are behaving. At the end of the day, trading limits can help a trader to not just manage their risks but also to analyze the markets and their trading strategies. One of the common misconceptions is that if you set a monthly trading limit to 20%, it doesn’t mean that you are limiting your drawdown to 20%. For example, in the first month of your trading, if you were down 20%, you would incur a 20% drawdown. Now in the second month, if you incur another 20% trading limit, your drawdown would be at 40%. While trading limits don’t guarantee you to limit your drawdown, the fact that you are alerted when you are reaching your trading limits will ensure that you are aware of the performance of your trading strategy and take the necessary steps to correct them accordingly. Thus, in conclusion, trading limits is part of the risk management methods that neatly ties in with a trading strategy and helps traders to build a disciplined approach to trading. Trading limits can be set based on a number of variables and it all starts with what a trader expects in terms of returns and how much of risk they are willing to tolerate. Having daily, weekly or monthly trading limits is not just a fancy concept but it is widely employed in many professional trading firms as it helps traders to manage not just their technical approach to trading but also helps to keep a check on the psychological aspects of trading as well. The original article appeared on tradingsim.com and is available here.